* ABG SHIPYARD: The Ahmedabad bench of the National Company Law Tribunal has rescheduled the hearing to Jun 25 on Liberty House Group's bid for the company on account of non-appearance of the resolution professional, Sundaresh Bhat. * ACC: Forayed into two new segments--aggregates and construction chemicals--as it aims to become a complete construction solutions company. * ADANI PORTS AND SPECIAL ECONOMIC ZONE: Will focus on "judicious use" of capital and declare dividend of up to 15% in 2018-19 (Apr-Mar). * ADANI TRANSMISSION: Has received a letter of intent from REC Transmission Projects Co, a wholly owned subsidiary of RURAL ELECTRIFICATION CORP, to build, own, operate and maintain a transmission project in Uttar Pradesh. * AURIONPRO SOLUTIONS: Has signed an agreement to provide cyber security platform 'Isla' to Hewlett Packard Enterprise. * BAJAJ FINANCE: Expects expansion in the distribution network and a larger customer base to boost assets under management by the end of the currency financial year. * BEML: The government has withdrawn Surina Rajan as a nominee director on the company's board. * BHARTI AIRTEL: Reliance Jio Infocomm and the company has offered to broadcast the FIFA World Cup 2018 live to its users through their respective television applications. * CANARA BANK: The board has approved raising equity share capital of up to 70 bln rupees in 2018-19 (Apr-Mar). * CIPLA: Uganda-based subsidiary Cipla Quality Chemical Industries is evaluating an initial public offering. -Has received final approval from the US Food and Drug Administration for its Abbreviated New Drug Application for Isoproterenol Hydrochloride injection, a generic of Hospira Inc's Isuprel injection with 0.2 mg/ml strength. -The company's Ugandan subsidiary, Cipla Quality Chemical Industries has said it is looking to partner with the government of Uganda to increase access to cancer treatments. * CONTAINER CORP OF INDIA: Signed a memorandum of understanding with Bangalore Airport Terminal Services on Tuesday for providing ground handling and other airport-related services on a pan-India basis. * DISH TV INDIA: RARE Enterprises has bought 13 mln shares or 0.7% stake in the company at 71.30 rupees per share in a bulk deal on the National Stock Exchange. * HCL TECHNOLOGIES: Has sought government approval to set up a new information technology or information technology-enabled services special economic zone in Vijayawada, Andhra Pradesh, with a proposed investment of 4.08 bln rupees. * HDFC BANK: The Union Cabinet has approved the bank's proposal to raise 240 bln rupees in foreign direct investment to fund growth. Has received government approval to raise up to 155 bln rupees through qualified institutional placements. * HERO MOTOCORP: Has increased its lead over rival Honda Motorcycles and Scooters India (HMSI) to over 21.5 mln units in the first two months of the current fiscal. * HINDUSTHAN NATIONAL GLASS & INDUSTRIES: Has sold 11.23% stake in joint venture HNG Float Glass to Trakya Cam Sanayii AS for 1.3 bln rupees. 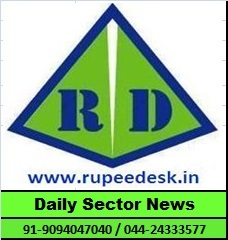 * HINDUSTAN PETROLEUM CORP: The company and OIL INDIA will shortly form a city gas distribution joint venture. * HOUSING DEVELOPMENT FINANCE CORP: Wholly-owned arm HDFC Capital Advisors, through HDFC Capital Affordable Real Estate Fund, has acquired significant minority equity stake in Homekraft, which will create $300 mln affordable and mid-income housing platform. Has been ranked as the fifth biggest public company globally in the 'consumer financial services category' on a list compiled by Forbes magazine. INSURANCE CO through an offer for sale on Thursday and Friday. Marg ERP said it has partnered with the bank to offer integrated payment solution on its platform to Ministry of Micro, Small and Medium Enterprises. * IDFC: Manish Kumar has ceased to be nominee director representing the Government of India on the company's board with immediate effect. * INDIAN OVERSEAS BANK: Has repaid additional tier-I bond investors before the due date. * INFOSYS: Will hire 500 US designers from Rhode Island with specialised design skills in the next five years. The company's head of manufacturing, Nitesh Banga, left the company to take over as the chief operating officer of GlobalLogic, a privately-held company valued at over $2 bln. * JET AIRWAYS INDIA: To cater to unserved regions and connect under-served airports, the company is all set to commence its 'UDAN' operations from Lucknow today. * JUBILANT FOODWORKS: Has set an ambitious target to open 75 new stores in 2018-19, more than double the number for stores it opened in 2017-18. * KANSAI NEROLAC PAINTS: Has commenced production at new manufacturing unit at Sayakha Industrial Estate in Gujarat. * KOTAK MAHINDRA BANK: Expects its loan growth to remain above 20% in 2018-19 due to a gradual improvement in lending conditions. TECHNOLOGY SERVICES to 75% or below this year, well ahead of the regulatory deadline of 2019. * LUPIN: Has launched tobramycin inhalation solution in 300 mg or 5 ml strength in US. * MAHINDRA & MAHINDRA: Is positive on the outlook for 2018-19 as it expects strong demand for utility vehicles and tractors. Is confident of recording at least 20% growth in disbursements in 2018-19. Facing stagnancy in passenger car sales of electric vehicles, the company's subsidiary Mahindra Electric is focussing on sales to fleet operators like Uber, Ola, Zoomcar and others, to drive growth in this segment. * MAN INDUSTRIES INDIA: Board has approved divestment of its stake in wholly-owned subsidiary Merino Shelters. * MONNET POWER & ISPAT: Subsidiary Monnet Power appears to be headed towards liquidation with no bidder turning up on the final day to submit bids, which also raises questions about faith in the administration's ability to resolve the stress in the sector. * MONSANTO INDIA: Bayer AG has made an open offer to acquire 26% additional stake in the company. * OBEROI REALTY: The company's qualified institutional placement has opened on Wednesday. * PAGE INDUSTRIES: The company and Jockey International Inc have extended their exclusive licence pact for India, Sri Lanka, Nepal, Bangladesh, and the United Arab Emirates till the end of 2040. * PUNJAB NATIONAL BANK: Has strengthened its mechanism for recovering bad loans by asking all its general managers and deputy general managers at its headquarter to monitor all non-performing asset accounts above 50 mln rupees. * RELIANCE INDUSTRIES: Subsidiary Reliance Jio Infocomm has hit the bond street to raise about 20 bln rupees, soon after the Reserve Bank of India raised the policy rate for the first time in more than four years last week. * RUCHI SOYA INDUSTRIES: Has said its committee of creditors has declared Adani Wilmar as the highest bidder to acquire the debt-laden firm. Patanjali Ayurved, which is in race to acquire the company, has been given time till Saturday to match or better the highest bid of about 60 bln rupees offered by Adani Wilmar. * SHREE CEMENT: Expects a recovery in cement prices after the end of the monsoon season. * STATE BANK OF INDIA: Is confident of maintaining slippage ratio, as well as credit cost, at around 2% of advances by the end of 2018-19. * SUN PHARMACEUTICAL INDUSTRIES: Investors' focus will now shift to ramp-up and profitability of the company's specialty products pipeline, after the US Food and Drug Administration cleared the company's Halol unit in Gujarat on Tuesday. * SUPREME INDUSTRIES: Smallcap World Fund Inc sold 1.3 mln shares or 1% stake in the company at 1,250.20 rupees per share in a bulk deal on the National Stock Exchange. * TATA COMMUNICATIONS: NEP Broadcast Solutions and the company have completed the remote production and broadcast of VIVO IPL for Star Sports. * TATA STEEL: The company's intent of doubling capacity in the rapidly growing Indian steel market could go awry if its joint venture for its European operations does not absorb as much debt as planned earlier. * TRIVENI ENGINEERING & INDUSTRIES: Has signed a concession agreement with Uttar Pradesh government for development of sewage treatment plants and associated infrastructure on hybrid annuity publicprivate partnership basis at Mathura. * USHA MARTIN: the company's decision to put its 1-mln tn steel unit on the block has attracted at least four large suitors. * VEDANTA: Copper imports by the company are about to rise fourfold as Tamil Nadu government ordered a 400,000 tn smelter owned by the company to be closed permanently in the wake of deadly protests over alleged pollution. * VIDEOCON INDUSTRIES: The Bombay High Court has disposed of a petition filed in January by the company, objecting to the initiation of bankruptcy proceedings against the company. * ZEE ENTERTAINMENT ENTERPRISES: Expects to beat the industry's 10-12% advertisement revenue growth estimate in 2018-19 on the back of increased market share across channels.